Seven years ago, my college roommates dragged me to my first yoga class — a Bikram session in the suburbs of Los Angeles. Although the sweltering room held dozens of people, the tiny, severe instructor spent most of the class looming over my mat, readjusting me as I clumsily labored through the routine. I didn’t set foot in a yoga studio again, until this morning. So, I’ve decided to give yoga another go. 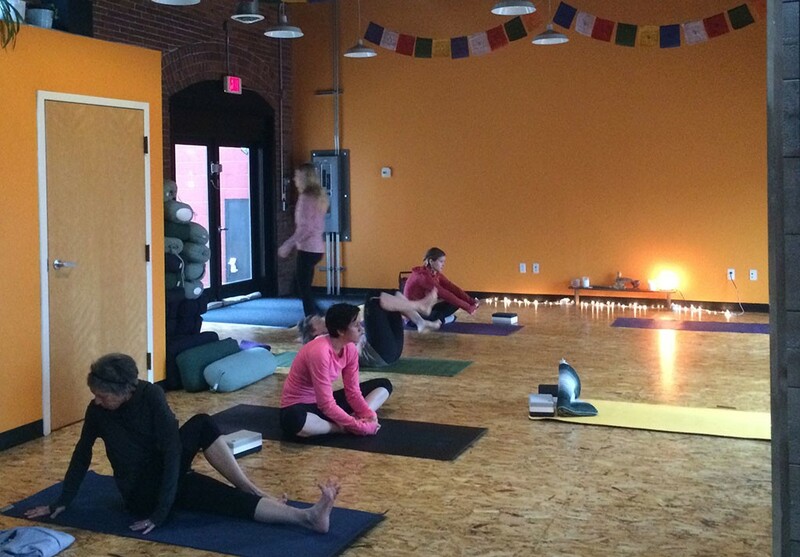 Burlington has an abundance of studios, and Seven Days’ Yoga Week seemed like an opportune time to speed-date them. My goal: to attend at least a class a day until Sunday, or until my body breaks. Centrally located near the intersection of Pine and Main streets, Sangha Studio is small, with exposed brick and marigold-colored walls, tall windows and prayer flags strung between pendant lights. Perfectly sized for Tuesday’s 11-person, all-female class. Around 7:30 a.m. this morning, I lay there on my back, body contorted. Downtempo electro-pop played in the background. Morning Movement consists of what must be fairly basic poses, because I was able to passably perform most of them — chaturanga, downward dog, dolphin, cobra, child’s pose. But it wasn’t geriatric yoga; I was sweating 15 minutes in. Jacque was mercifully hands-off. That meant I sometimes had to mimic the people around me. (To the woman with a hyacinth tattoo on the mat to my right: I’m sorry for all the creepy glances.) But this was less stressful than feeling like I was on the verge of flunking out. Jacque’s most common piece of advice, always directed at the entire group, was to breathe — something I consistently forgot to do. Her encouragement was also inclusive, so that when she said, “Beautiful, everyone,” I could pretend she meant me, too, standing in my wobbly warrior pose. I left feeling relaxed, with no apparent muscle strains. Parting impression: I’m not head over heels yet, but it was a good first date.